After 22 yrs I treated my C10 to new exhaust! Last year I did a baffelectomy to my oem mufflers and didn't really care for the sound. It was just louder but doesn't suit my taste. So a couple of weeks ago I replaced the mufflers with these. Price is right and install is rather simple. Fired up the C10 they sounded pretty decent under acceleration but were popping and kind of a backfire under deceleration. Some like the sound but wanted a little more quietness. I found on the forum an article by Jim Snyder about packing 1 Stainless steel scouring pad into each muffler. Just remove the baffle, (1 screw) stretch out the pad ,6-8 inches, and shove it up the muffler just past the baffle. Reinstall the baffle. That's it! To me it sounds great "mellow" in normal running and a real NICE burble on deceleration. I am happy with the results. How about some audio! Let's hear 'em! I took Jim's advice as soon as I got my Delkevics. I went a step farther and put TWO pads in each can. The bike still runs like a champ, has a nice voice, but still maintains my preference for a "quiet" bike. Best of all worlds. I did the same thing but removed the pot scrubbers as they reduced my top speed by 10mph. And that is a bad thing?? The SS pot scrubbers are very porous and should not effect top end power. The baffle cone at the front of the baffle is what kills top end power. I drilled a half inch hole in the front cap of the baffle and that solved the top end power issue. I have been eyeing the Delkevic's for a long time, and that price does look right. What kind of tone do they produce? does it make the Concours sound like a true sport bike? cruiser rumble? somewhere inbetween? 4 into 1 exhaust so mine is considerably louder. I have been running Delkevics for almost 8 years (before they had mufflers for the Connie's). I even got the C-14 guys to try them (after some prodding) and they like them to. If you had asked me that before I wrecked last month I would have said yes. VT, here is my youtube video I made several years ago on my carbon fiber Delkevic. If you type in "Delkevic mufflers on a C-10 Concours there are also videos of two muffler conversions on the C-10. oh I have popping and burbling and popping on decell, but I'm still running 36mm Ninja carbs..... no 2 minute mod on Zilla... not what it was built for... now I gotta install the toss away gears Bubba sent me from his 7th gear conversions, and this bike will take on all comers in the 1000cc Conni class, without a doubt. Half a Century? Dang I didn't think it had been that long. Seems like it was only 20 years ago !!! I still get compliments on the Contario exhaust even after all of these years. Nice choice! I have the exact same kit on my '01 Fat Ninja. It doesn't make the Concours sound like a modern supersport -- it doesn't have the same regular cadence ascending to a primal wail that a ZX-6R or a ZX-10R has at full whack. Instead, I'd say it's a deep, mellow idle that turns into a classic inline-four growl at cruising speeds. Sounds (unsurprisingly) a lot like my old GPz900R used to. At the top of the tach (where I like to spend time when I can), it howls nicely without being obnoxious. Of course, ol' Connie can't quite hit the high notes like the newer, smaller-displacement supersports, but the Delkevics make it sound a little more track-ready. All in all, a good compromise, I think, and a good fit for this bike. I'd like mine to be just a touch quieter, but I'm not about to take them apart and start stuffing things in them -- if it ain't broke, and so forth. Oh boy. Thanks for posting the video, I am sold. Ordered a pair of the 14" Stainless. Whicked excited! What are the benefits of choosing one size muffler over another? 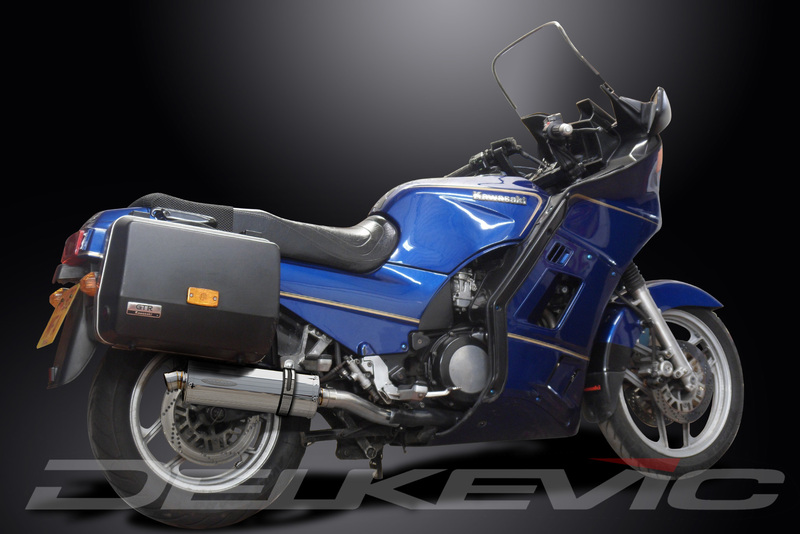 I see on the Delkevic site that there are various size mufflers for the ZG1000. Just a guess but maybe the larger mufflers have a lower exhaust note. Shorter canisters might be a little lighter in weight but not by much. They are a little louder in noise as they come(compared to stock) but you can tone them down like I did. Took about 10 minutes and I like the tone of the exhaust just the way it is now. Thanks for that info! If/when I get these I'll probably do the mod like you describe. I presuming that once I have them it will be easy to determine where to add the SS pads. There is one screw at the end of the exhaust that holds the baffle tube in place. Remove screw and pull the baffle out. It's about (10) inches long. With a flashlight you will see where the front of the baffle rests. Just beyond that you can add a Stainless steel scrub pad that has been stretched some (2 to 3 times bigger). I inserted that just ahead of where the front of baffle tube sets. Refit the baffle. I did both mufflers. Start engine and listen. I got the S. S . pads at Target (3 to a pack) for about $2.10. Before you do all this ride the 'cycle after you install the mufflers. You may like it as is. Watching another video Jim Snyder posted of the 18" Stainless, it had a nice deep tone and wasn't that loud. I want just a little more noise, but also as much deep tones as possible. I imagine the 14" will be a perfect compromise, and I will make a video once they are installed. Sounds easy, I plan to install them stock with silencers and go for a ride before I make any adjustments. I am positive I will take the silencers out, and will make the hole in the baffle to maintain performance. All bikes are different so I will see what the decell popping is like before adding the scouring pads. I do have the emissions blocked off, and the 2mm kit installed and on the rich-side of things, so I will see how nicely that all plays together. Looking forward to checking out the video when complete! Should not but did. I suggest you do the same thing I did and do back to back top speed runs with and without the pot scrubbers before making a blanket statement dismissing what I discovered. Sorry Pb I wasn't saying you were wrong but I did all of these tests years ago. Of course I am dealing with one muffler on a 4into1 pipe so I have more exhaust flow to work with than a two can setup. You can ask any of the old timers on here, I know my stuff when it comes to exhaust. Hey. Thanks. Did not mean to sound harsh. Carry on..